In How to Read the Bible, Harvard professor James Kugel leads the listener through the "quiet revolution" of recent biblical scholarship, showing how radically the interpretations of today's researchers differ from what people have always thought. The story of Adam and Eve, it turns out, was not originally about the "Fall of Man," but about the move from a primitive, hunter-gatherer society to a settled, agricultural one. As for the stories of Cain and Abel, Abraham and Sarah, and Jacob and Esau, they were not about individual people at all but, rather, explanations of Israelite society as it existed centuries after these figures were said to have lived. In the earliest version of the Exodus story, Moses probably did not divide the Red Sea in half; instead, the Egyptians perished in a storm at sea. Whatever the original Ten Commandments might have been, scholars are quite sure they were different from the ones we have today. What's more, the people long supposed to have written various books of the Bible were not their real authors: David did not write the Psalms, Solomon did not write Proverbs. Such findings pose a problem for adherents of traditional, Bible-based faiths. Hiding from the discoveries of modern scholars seems dishonest, but accepting them means undermining much of the Bible's reliability and authority as the word of God. What to do? In his search for a solution, Kugel leads the listener back to ancient biblical interpreters who flourished at the end of the biblical period. Far from naÃ¯ve, these interpreters consciously set out to depart from the original meaning of the Bible's various stories and prophecies - and they, Kugel argues, hold the key to solving the dilemma of reading the Bible today. 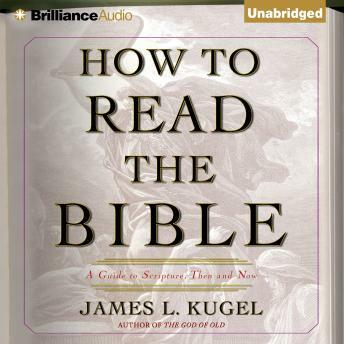 How to Read the Bible is, quite simply, the best, most original audiobook about the Bible in decades. Clear, often funny, but deeply serious in its purpose, this is a book for Christians and Jews, believers and secularists alike.